I’m gonna get right to the point here..this Broccoli and Cheddar Stuffed Chicken Breasts Recipe was ridiculously good. The chicken was so tender and juicy, and the filling was creamy, cheesy, broccoli heaven. Everything was perfectly flavored, and it made for fantastic leftovers. Getting the chicken artfully rolled up without all the yummy filling oozing out can be a bit of a task, but for such a delicious meal at just 5 Points per serving, it is absolutely worth it. I’m a firm believer that cheese makes just about anything good, and this Weight Watchers chicken recipe is no exception. Seriously, it’s really, really delicious. Go make it…now!! This incredible chicken recipe was mouthwateringly delicious! Tender, juicy, well seasoned chicken breasts wrap around a creamy, cheesy, broccoli filled center. Winner, winner, chicken dinner! Prepare the chicken by slicing across each fillet horizontally, resulting in 2 thinner chicken fillets from each 8oz breast. The, using a meat mallet, gently flatten and thin the chicken. You’ll want a total of 6 fillets, about 1/4” thick each. Preheat oven to 375 degrees, and line a small baking sheet with parchment paper, and mist it with nonfat cooking spray. In a medium sized bowl, combine the broccoli (preferably while still warm from being steamed), cream cheese and cheddar cheese, and mix well. In a separate shallow bowl, combine Panko, garlic powder, onion powder, parsley and salt & pepper, and mix. Place liquid egg substitute in another shallow bowl. Season one side of chicken fillets with additional garlic powder, salt, and pepper. 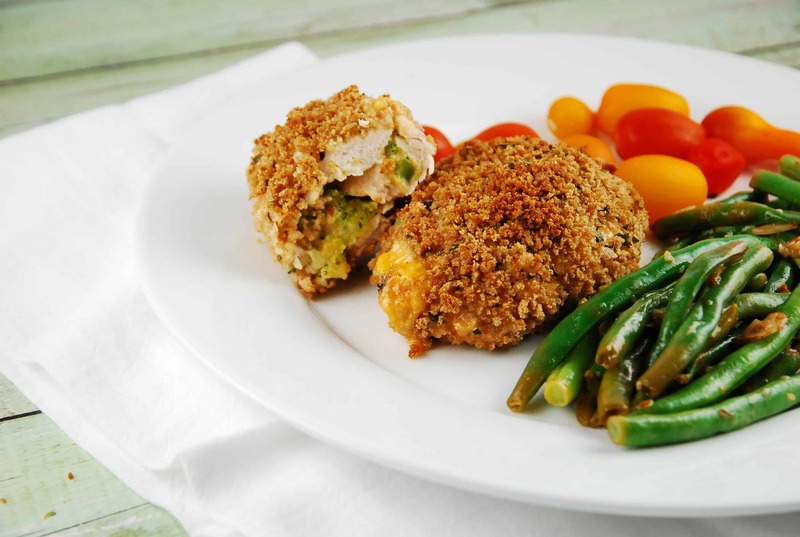 Spoon the broccoli and cheese mixture into the center of each chicken fillet, dividing it equally among all 6 pieces of chicken. Carefully roll up the chicken and secure with 3-4 toothpicks as needed. Dredge the stuffed chicken breasts in the egg mixture, gently shake off the excess, and then dredge in the Panko. Place on baking sheet. Repeat until all stuffed chicken breasts are complete. Place baking sheet in the oven and cook until chicken is entirely cooked through, about 25-30 minutes. Let cool about 5 minutes. Remove toothpicks and serve. I love your recipes, but can’t get to go the print friendly page. Tried copy and paste and that didn’t work either. any suggestions? Thank you so much for this! I will make this for my boyfriend as an appetizer this weekend. Love this recipe, used white cheddar and really enjoyed it. Always looking for new ways to make chicken. I am having trouble printing a single recipe. I get too many unwanted pages. Is this intetional?